With so much in common, you might think these two stores are pretty much the same thing. The truth is, there are also some important differences. Let's take a look at each store in depth to determine which deserves the title of Arizona's Best Outfitter: Cabela's or Bass Pro Shops. This store opened in Glendale, Arizona near the Westgate Shopping Center in July 2006. The 160,000 square-foot building is more than just a retail store - it also features a massive aquarium, restaurant, indoor archery range, and gun library. Cabela's welcomes everyone, even if you drive a big rig or RV. It's hard to ignore the massive selection of watercraft as you enter the store. Cabelas' boat center carries boats from Alumacraft, Bayliner, Lowe, Maxum, Monark, Ranger, and Stratos. They mostly carry bass boats and fishing boats, but within that segment there is something for every budget. One of the most unique aspects of the store is their wild animal gallery. This museum-like exhibit features trophy animals stuffed and mounted in recreations of their natural habitats. The store also has a large aquarium with dozens of different species of fish. The simply-named Cabela's Restaurant offers traditional fare such as hamburgers, hot dogs, and pizza as well as more exotic fare. The menu also offers deli-style sandwiches made with your choice of elk, wild boar, bison, or ostrich meat. There is also a selection of soups, salads, desserts, and drinks to round everything out. As far as shopping goes, I feel like Cabela's has an excellent selection of camping and outdoor supplies. There's even a "Bargain Cave" featuring open-box, returned, and closeout items at reduced prices. Located on the opposite side of town is Bass Pro Shops, just off the Loop 202 freeway in Mesa. This 170,000 square-foot megastore opened in June 2007 and like Cabela's, it's more than just a store. Bass Pro Shops has a massive indoor aquarium with a waterfall, a boat dealer, and the Islamorada Fish Company restaurant. The outside of the store features a selection of watercraft from Tracker, Sun Tracker, Nitro, and Tahoe boats. Once inside the store, the sheer size of Bass Pro Shops is overwhelming! The 60-foot tall ceiling and second-story windows flood the store with natural light. The store's 18,500-gallon aquarium is centrally located and features a huge waterfall, something Cabela's does not have. The feeding schedule is posted on the store's website in case you want to plan your visit around it. Bass Pro Shops' website also lists a schedule of in-store workshops for things like fishing, shooting, and boating safety. Cabela's offers similar workshops for archery, concealed weapons, and Game and Fish Education courses. Bass Pro Shops features over 400 stuffed and mounted examples of game throughout the store, rather than in a designated area. 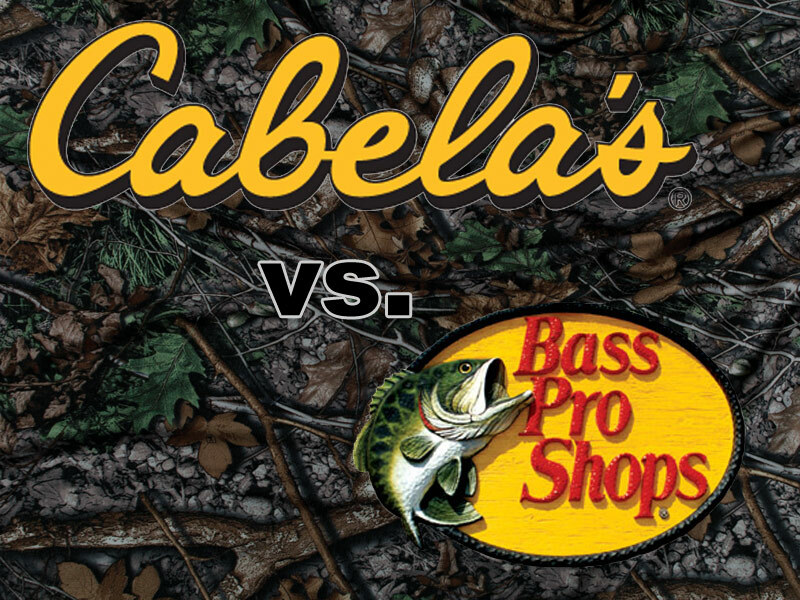 Both Cabela's and Bass Pro Shops have a lot in common. Personally, I feel that Bass Pro Shops has more of a "Wow" experience when visiting the store, but Cabela's is where I would go when I actually needed to buy something. I feel that their product selection is a bit better, and Cabela's is far closer to me than Bass Pro Shops. Which store do you prefer, and why? Post your comments below. I like Bass pro much better for a couple of reasons. The first reason is i was shocked at how unprofessional the management staff is with their outfitters that work under them. The second reason is on my last visit to cabelas one of the outfitters supporting the name tag Randy made a foul remark obout a womans breast size who was walking into the building in front of my wife & I.
I live in Glendale only minutes away form Cabelas & I m more than happy to travel to mesa to Bass pro shops.